Over the years BAWS has been involved with many fine businesses, companies, and people. The goal of each partnership is to add value to the event and to provide a platform for each partner/sponsor to promote their product or service. Spalding is and has been the most important BAWS partner. All the baseballs at BAWS are Spalding brand. Additionally, each year Spalding has donated numerous high quality gloves that have been given as awards to players who have earned top recognition honors at BAWS events. 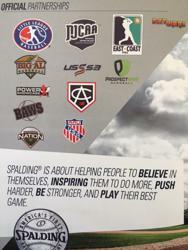 The official BAWS/Spalding partnership can been seen in the Spalding product catalog, with the BAWS logo among other well-respected events and recognized baseball organizations such as Little League Baseball, Area Code Games, ProspectWire, USSSA, East Coast Pro, and National Junior College Athletic Association (NJCAA). Other partners have donated gear, some have sponsored jerseys or T-shirts, some have provided services such as photography or video, while some have provided media exposure. There are many ways in which a business can enhance the experience at BAWS and there are many ways in which BAWS can activate each partnership/sponsorship. If you would like to inquire about how you can be involved with BAWS, please contact me at BayAreaWS@yahoo.com.